Nahuelito is not alone (posted Here); it is merely the most famous of the Patagonian lake monsters. There are many other lakes and streams boasting their own creatures, as well as more native legends about strange aquatic beings. Mapuche myths describe several “small-sized” water beings; we have already mentioned the Camahueto "unicorn" and "Trehuaco" but there are many others. Today we will write about the"Cuchivilu" of Chiloé Island. 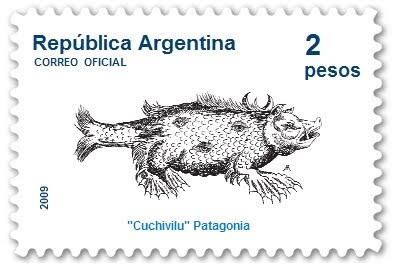 "Cuchivilu" stamp, inspired on an image by Ashton. Its name comes from the Mapuche words “cuchi”, pig and “vilu”, snake; it is a strong and unwieldy pig-like creature. It is considered a degenerate being (“piguchén”) that lives in caves by bogs and lakes. It snorts like a pig and the upper part of its bulky body is pig-like while its rear resembles a snake. It drags itself along the sea shore destroying the fishermen’s traps and eating the fish that they hold. Cavada, F., (1914). Chiloé y los Chilotes. Santiago: Impr. Universitaria. Chap. v.
 Ashton, J., (1890). Curious Creatures in Zoology. London: J. C. Nimmo.